Introduction: Preview of course & materials, brief overview of the TOEFL test, and what to expect test day. 9:15-9:45 How to take notes on the TOEFL iBT: A run-through of how the test delivers information, explaining the concepts and providing advice, while focusing on the major elements necessary to understand how the TOEFL works. Reading – What to expect by reviewing the nine questions types, how often you will encounter each and how to attack by dissecting how the iBT Reading delivers information (and misinformation) through practice sessions. Listening – Looking over an official iBT script will help you understand how the TOEFL delivers information. By focusing on the four elements you must remember to succeed, we review a standard conversation, talk, lecture set. Speaking – An overview of the six question types explains how to prepare your note-taking organization strategy. Next, we unpack the three common pain-points when speaking: pronunciation, rhythm, and cadence. Writing – How to outline your two essays to maximize your time by taking great notes and explaining points efficiently. We also review what not to do, 20 common grammar mistakes, and how to make your paragraph flow. ► Experience how the TOEFL test is delivered in the official TOEFL center. 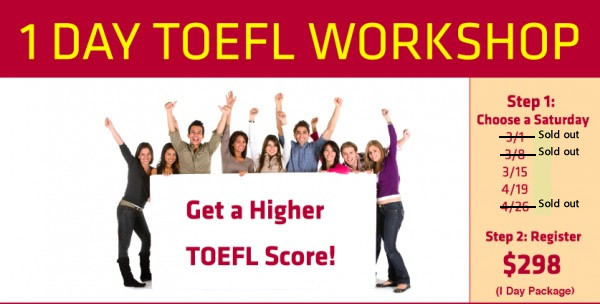 ► Get accurate projections of TOEFL score, with all four sections analyzed. ► Get detailed report assessing strengths & weaknesses in the Writing and Speaking section. ► $200 Additional cost is required. ► Receive an e-mail reminder of the test the day before. ► Receive a phone call reminder at 8:00 AM the morning of the test.